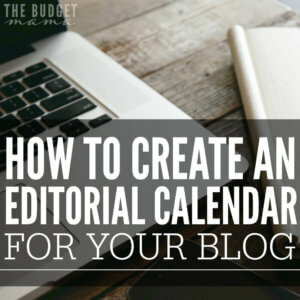 If you have been blogging for any length of time, you have more than likely have heard that an editorial calendar is a must have. 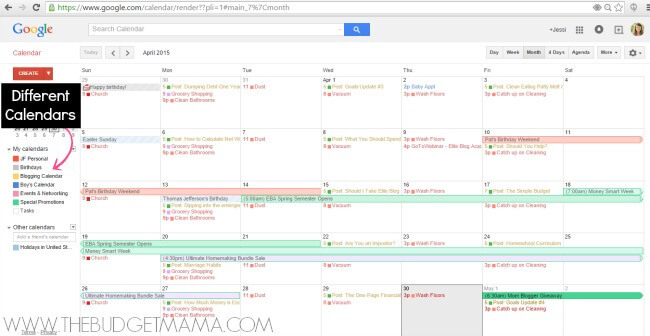 However, figuring out how to set up and manage your calendar can be tricky. It took me about a year to come up with a system that works well for me. I use my Google Calendar as my editorial, cleaning, appointment, events/promotions, and networking opportunities calendar. I still like to have a paper planner for regular day-to-day stuff like my to-do list but my overall calendar is my Google Calendar. If you were not already aware, Google Calendar has a feature where you can set up different calendars in your Google Calendar so your events can be different colors and you can single out calendars to view. Above is a screenshot of my whole calendar and then below is a screen shot of just what my blogging calendar looks like. 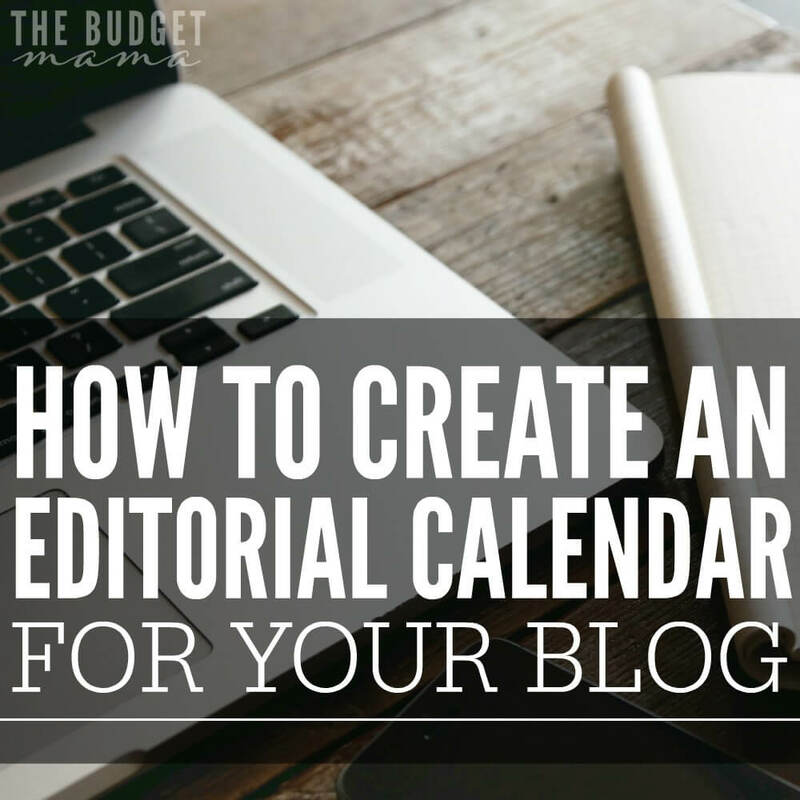 My blogging calendar only lists my blog posts which helps me to organize the flow of my posts and to make sure that when I have sponsored posts that I have allotted enough time for me to write, edit, and complete my sponsored posts. This also allows me to plan around holidays like Mother’s Day or Christmas and allows me to plan around special themes like April, which is Financial Literacy Month. Therefore, I know in April to concentrate more heavily on money posts than any other type of post. My special promotions calendar allows me to track things like affiliate sales (for more on how I manage my affiliate marketing, sign up here to receive my free eBook), special promotions (like the money smart week), and giveaways. This helps me keep track of what I should be promoting and when I should be promoting it. 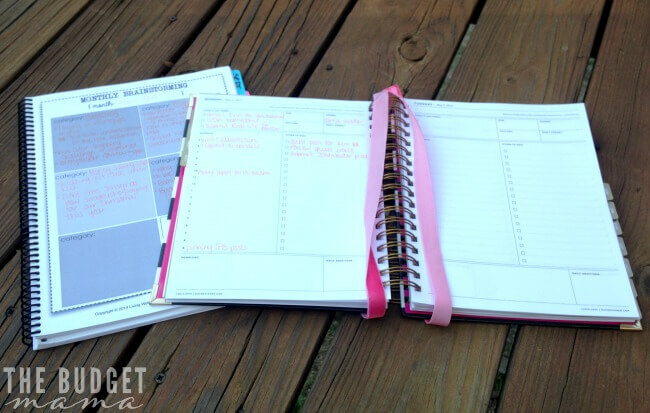 My paper planner is from Day Designer * and I use it for my to-do list and daily tasks. I tried using the Google Tasks list but since I am a stay-at-home mom, I cannot be on my computer or phone all day long so having a paper planner that I can refer to often makes my life a tad bit easier. My method for planning posts is pretty simple. I use the Monthly Brainstorming section of my blog planner (from EBA) to help me brainstorm various post ideas. Once I have some ideas listed out, I head over to my Google Calendar and organize the posts. I will rearrange posts as necessary if I receive a guest post or have a sponsored post that comes up. I can then in the individual event in my Google Calendar, write out an outline for the post and include any relevant links. I also love that I can add attachments to my events so I can upload documents like sponsored post requirements or reference materials I need when writing the post. This system gives me amazing flexibility because sometimes, I just do not feel like writing on a specific topic. For example, if instead I am in the mood to write a post on how I stopped spending and starting saving and not the family recipe binder post from above, I can easily move the family recipe binder to another day. No crossing out, no scrambling to figure out where I will put the post and no stressing about having to write about something that I’m just not in the mood to write about. 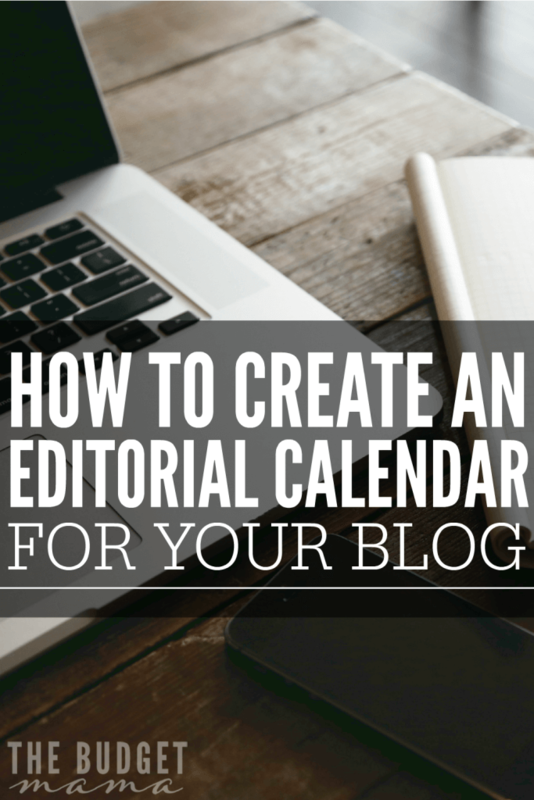 An editorial calendar was designed to make your blogging life easier, not more difficult. Therefore, if the current system you are using stresses you out, try out a different system until you have more control over your calendar and posting schedule. What system do you use for your editorial calendar? I haven’t tried the Google calendar before, I will have to give that a try. Right now I use a paper day planner and the WP Calendar plugin. The Google calendar definitely looks like it can do a lot more for me. Thanks! I don’t have a system yet, but I know that I really need to get more organized about it. I just purchased Kat Lee’s Blog Planning Kit to help get me going. Great tips! I am really working on writing posts ahead of time. I would love to have a couple of weeks lined up already so that I can be more flexible if needed. How far ahead do you tend to write your posts? I currently use a word document calendar to organize my posts (then save it to my dropbox), but I’ve been thinking about switching to Google. This post might have convinced me to make the switch. Heck, Google knows everything else about me… why not my blog schedule, too! What is your secret to getting (and staying ahead) with your posts? I get excited when I have one or two posts written ahead of time (meaning before the night before they’ll be published), but I can’t seem to get any further ahead than that. Do you set deadlines for yourself and just stick to them? Do you also write your posts in your agenda? I’m just thinking about when I multitask and can brainstorm on a play date or while my kids are bowling or at the library….how do you handle that? I also need a combination of paper and Google calendar for everything. Even though I am a lot online as I recover from a brain surgery, there are times that I need to check things away from the computer. That’s so interesting! While I use the Google calendar for everything else in my life (and sync it with my husband’s calendar), I still use a paper copy for my blog. There’s something about being able to look at it on paper yet for me. Funny, really, since blogging is all online! Thanks for sharing this idea, though, and how it works for you! This was so helpful! Ive been using a paper calendar and Im starting to get sick of erasing and re-planing as things change. 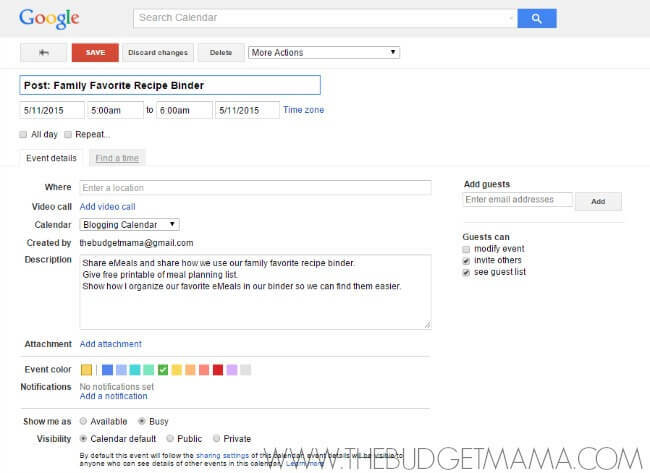 I am definitely going to start using my google calendar more and keep my paper calendar for my daily items. Thanks for the tips! I have been following your blog for quite some time and you bring me such inspiration for becoming a stay at home mom and a blogger who can keep control of finances! Thank you so much! Please continue to post such incredible information!